This chapter presents main assumptions and component modules of a concept integrating physical and computer simulation areas. The proposed approach utilizes capabilities of modern thermo-mechanical simulators of Gleeble 3800 series in the modelling of high-temperature steel deformation processes, as well as in the modelling of integrated casting and rolling processes of flat strands with a solidifying core. 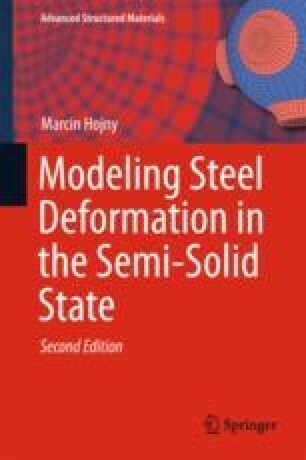 Other components, which are necessary, are mathematical models including a hybrid-analytical model of steel deformation in the condition of the liquid and solid phase coexistence for the axially symmetrical state, which constitutes the main foundation of the developed modelling concept, and mathematical models in the form of 3D solutions based on finite element, smoothed particle hydrodynamics and Monte Carlo method.